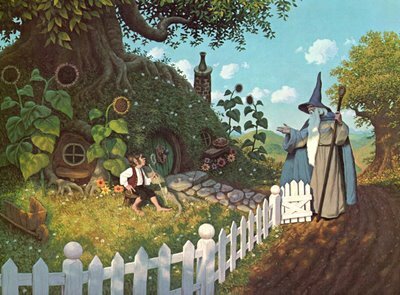 By some curious chance one morning long ago in the quiet of the world... ...Gandalf came by. Rosencrantz: [dramatically] It was urgent — a matter of extreme urgency, a royal summons, his very words: official business and no questions asked — lights in the stable-yard; saddle up and off headlong and hotfoot across the land, our guides outstripped in breakneck pursuit of our duty! Fearful lest we come too late. Guildenstern: Too late for what? Rosencrantz: How do I know? We haven't got there yet. The first step on The Hero's Journey: the hero learns that he or she must leave the known world behind and venture to unknown regions. How the hero reacts to the call to adventure varies, but heroes who initially reject the call are usually significantly worse off than if they had accepted. The Call to Adventure may be carried to the hero by one or more Heralds. Not to be confused with The Call, a 2013 film, nor with Regina Spektor's song from the movie Prince Caspian.